We went to Robert’s for a belated Easter celebration as he gets ready to move into a new house. Of course he filled our bellies with good grub (bacon wrapped steaks, bébé taters, yum! 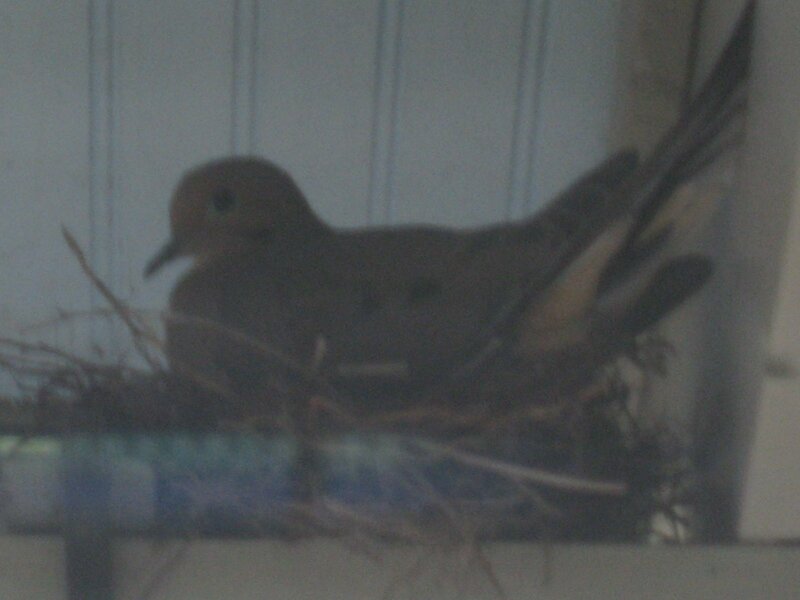 He’s got a pair of mourning doves nesting outside one window, and a pair of wrens nesting by the door. There’s also a set of cardinals that keep attacking a mirror that sits outside. I watched an osprey circle off toward the hills and the kingfisher fishing in the estuary. I know he’s glad to be going to his own house, but I will miss the beauty of Larry and Bernie’s sprawling gardens and feeding the fat koi in the pond — and the frogs, too. Previous Post Unikirja on Amazon! Bacon wrapped steaks? Good lord, I want me some of that artery hardening yumminess! Bacon…steak… throw in some red wine and we’ve got a winnah! Oh, yeah — we had the red wine, too. Robert is an experienced feast master.